I guess it’s good to get these things out of the way early. Heh! I had a plan. It was a good plan. A great plan even. If I do say so myself. And I do. Because if I don’t… who will? As demanded by my nephew, age 2 1/2. 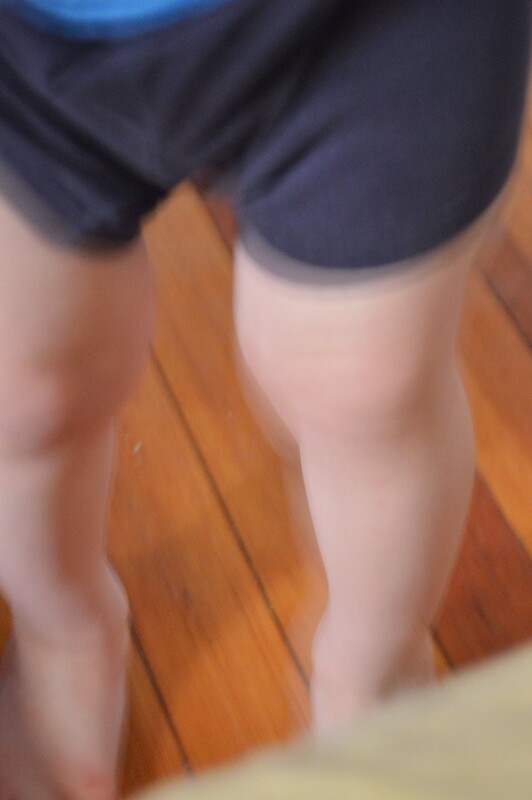 My sister has a strict rule against pictures of her children appearing on the internet, but I’m pretty sure a photo of the indistinguishable knees of her only male child would be considered harmless enough to not cause offense, if she even knew this website existed. You see, it’s like this. Back in April, after I was offered the short-lived disaster of a job I had this year, and negotiated a start date that would allow me to take a much over-due trip to visit my sister and her family, including four children (my nieces and nephew), two of whom I had never seen in person, I decided that it was the opportunity and excuse I needed to invest in a fancy new 35 mm digital camera. I’ve always been interested in photography and wanted to learn more about it and with a digital camera I’d be able to see the immediate results of my attempts to improve on technique and composition. I bought the camera and took it with me on the trip, and of course, as soon as I took the camera out on the first day, the children started being children and wanted to take pictures themselves, and tell me what pictures I should take (my nephew kept saying, “take a picture of mine’s knees”), and insisted on seeing the pictures the instant they were taken. Very few pictures were actually taken on that trip because the camera posed such a distraction and any hope of getting some candid, true life photos was dashed on the first day. Over the summer, I decided to take a photography class at the local community college. I knew from other’s experiences that this class would teach me not only how to compose a good quality, artistic photograph, but also, how to use editing software to make the picture look even better. A few days after I registered for the photography class, I decided to register for the first level, beginning swimming class and soon after decided that both classes were too much to do all at once, at the time. Ultimately, I decided that the swimming class was a higher priority because I wanted to be able to find a place to go to swim for exercise and once I had that covered I could be swimming for exercise while I learned to take and edit good quality photographs in a later semester. That is still the plan, although when classes start up again in a couple of weeks, I’ll be taking the next swimming class with the hope of getting more effective and confident in that skill. Photography will wait until Summer or Fall Semesters. The camera sits in its case for weeks or months at a time without getting used and I’ve never finished reading the owner’s manual, or the “Photography for Dummies” book that I purchased and lugged all the way to New York and back with me, without ever cracking the spine. During my most recent previous stint of unemployment, I began participating in a “photo-a-day” program run by the author of another blog, using just my iPhone and an Instagram account I haven’t even looked at in months. When I started working, I found myself far too busy and far to pre-occupied to keep up with it and I let it drop. Recently, my urge to learn to properly use my camera has returned, as has my desire to practice and build my skill. I have also wanted to get back to more regular posting here on this site, and not have everything be all gloom and doom and woe is me as the last several months have been. And then it hit me! The great idea! The perfect “solution”! “Photo-A-Day” meets “posting 365” (or whatever the hell they called it) meets new inspiration for both more and better photography AND more and more cheerful writing… I decided I would pull out the photography books and read a little bit of them each day, and I would combine that with the photo-a-day prompts from Fat Mum Slim and everyday, I would take a picture that is prompted by the Photo-A-Day prompt and post it on this here bloggy thingy. I would write a post about the photo if the spirit moved me, or I would just post the picture with a minimal explanation/caption and let it stand on its own. Every day. For 365 days. When I woke up I was hungry and didn’t have time for “what should I cook for lunch”. I needed to eat immediately, so failing all other options (or rational consideration thereof) I ended up eating a couple of Eggo toaster waffles. Once the waffles were gone and the dish was washed off and in the sink (the dishwasher is full of clean dishes and I haven’t put forth the effort to put them away yet) I went to the living room and sat down. It was only then that I pulled up the schedule of prompts for the photo-a-day program and saw today’s prompt: lunch. I couldn’t even think of a viable and reasonable way to cheat. This entry was posted in Family, Friends, Humor, Humor... Sort Of, Life, Photo-A-Day, Photography, Pop Culture, Stuff, Writing and tagged Family, Fat Mum Slim, FMS Photo-A-Day, Las Vegas, New Year's Eve, Nieces and Nephews, Photo-A-Day, Photography, Swimming, Swimming Class, Unemployed, Unemployment, Work. Bookmark the permalink.